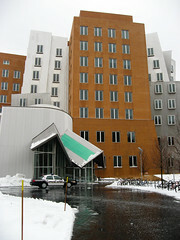 Today was the first day of Boston BarCamp (#2 for those counting) at MIT’s Stata Center. Thankfully yesterday’s snow storm wasn’t enough to cancel the event. There was still a healthy turnout of those who braved the icy conditions, with some coming from as far as upstate New York. A big thanks to those who coordinated everything despite the weather, making sure there were free t-shirts, caffeine and pizza for all. The first session I went to was Rod Begbie giving a primer on OpenID (slides are here). This seems like a technology that has gotten some recent momentum, and I was impressed how easy it was to have my domain delegate to another party (Vox in this case). After the good talk, Mike Burns mentioned they have used the Ruby OpenID library to implement OpenID for Student Art Space. That goes on the long list of things to do. After lunch heard Jerrad Pierce talk about Green Maps and GIS. I enjoyed his quick explanation of how Cambridge gets its water from Fresh Pond. Interesting to hear what happens before the tap is turned. The gadget that everyone seemed to want to see were the white and green laptops from the One Laptop Per Children (OLPC) project. They run a unique combination of hardware, consuming little power and creating mesh networks, and software, including Squeak and only OSS applications. But it is the small size, distinctive colors and "ears" that draw stares. Finished the first day at the "Drop Your Pants" session, giving anyone who wants to a chance to demo something they have worked on. Good range of interesting projects, from a funny to HAL-like voice recognition system on OSX to a slick-looking DropBox. </ul> Today also gave me a chance to play around with a Canon PowerShot SD700 I haven't had much to use yet. Many of the Stata Center's rooms were rather dark, offering the choice of a harsh flash or dark tones. When zoomed out, it was fine at f2.8, but zooming in (at 5.5f) left the shots too dark. The ones that came out alright are online.